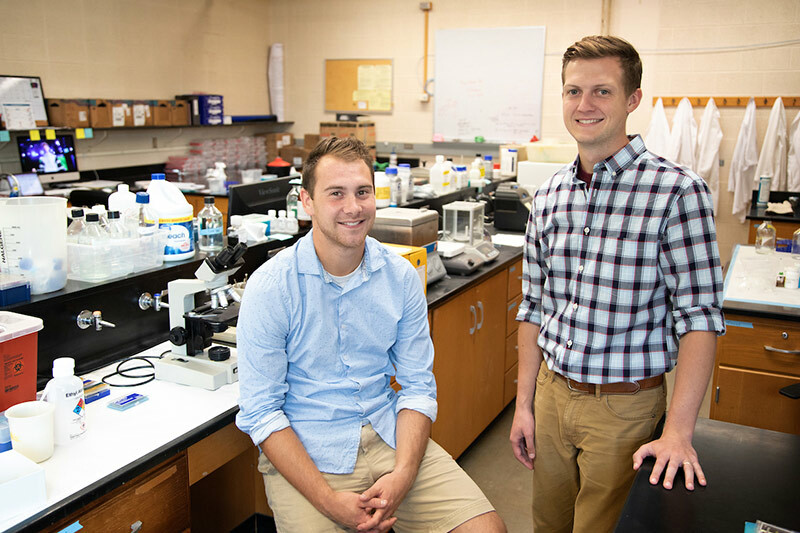 Nik Stevenson, left, and Jacob Robinson are currently researching a mature B-cell lymphoma called splenic marginal zone lymphoma (SMZL) for their master's thesis in Allwine Hall at UNO. Nik Stevenson runs an experiment for his master's thesis about splenic marginal zone lymphoma (SMZL). 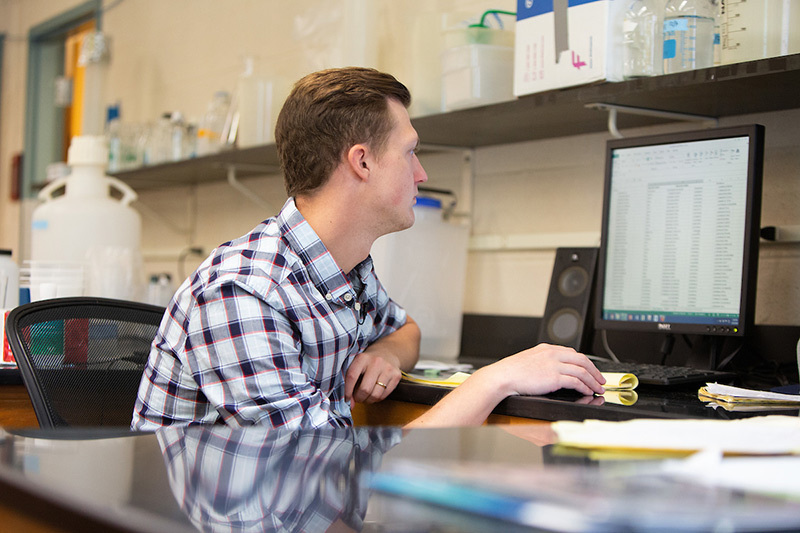 Jacob Robinson researches splenic marginal zone lymphoma (SMZL) for his master's thesis. A pair of University of Nebraska at Omaha (UNO) graduate students have made a breakthrough that one day could help better the lives of cancer patients. 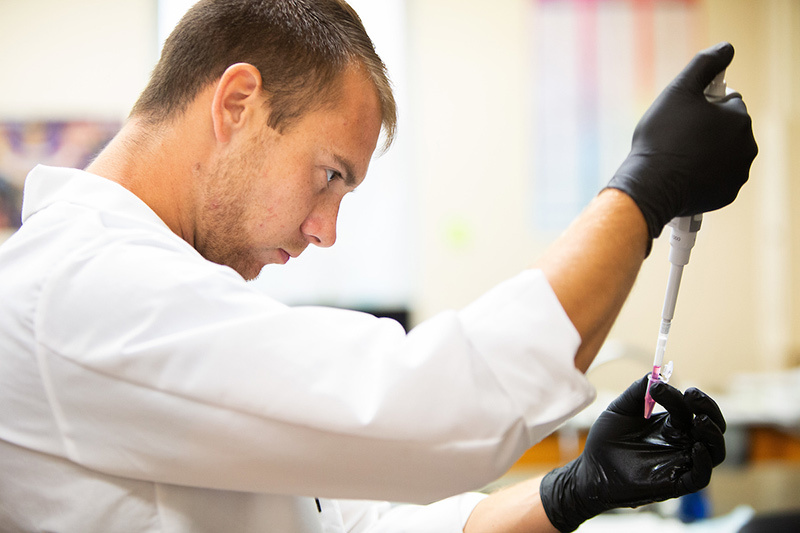 Nik Stevenson and Jacob Robinson, who will obtain their master’s degrees in biology from UNO, have been working with a mature B-cell lymphoma cell called splenic marginal zone lymphoma (SMZL). SMZL is a rare type of slow-growing sub-type of non-Hodgkin lymphoma that originates in the spleen. The lab became interested in this disease as another gene that the group works on (CAV1) was identified to be mutated in a subset of these cases. They realized there was no existing, reliable diagnostic tool and the common treatment required a splenectomy. There had to be a better way. Stevenson and Robinson each bring something different to the table. Stevenson is working and experimenting with the cell itself, performing wet bench research and studying cultures that he develops in the lab. Robinson studies large data sets and searches for patterns or markers that could help more accurately classify the cancerous cells. Many patients go through a very stressful "watch and wait" period before an accurate diagnosis can be made. Patients will meet with their oncologist every six months or so to find out if their cancer has spread. Robinson said this research could help patients have a clearer idea of what their cancer is like. Essentially, a doctor would run a panel of tests, looking for specific genetic markers in the cells that would help indicate how aggressive the cancer is. If the cell has a certain amount of markers, it’s a match. “Maybe instead of coming in once every six months, the patient would come in once every five years because they know how slowly it is progressing,” Robinson said. The duo agree that UNO was the right fit for their research because of the people and the environment.